Welcome to the mexbound.com guide to driving to Copper Canyon. We strive to provide you with firsthand, detailed information on driving directions and maps to the Copper Canyon area of Mexico. Before you leave on your next adventure south of the border, be sure to purchase Mexican Insurance from mexbound.com. Remember, mexbound.com is "the first choice for the smart traveler." Copper Canyon can be traversed by either starting in Chihuahua City in the State of Chihuahua which is located located 233 miles from El Paso Texas via highway 45 or by starting at Los Mochis in the state of Sinaloa, located 473 miles from Nogales via highway 15. Driving in Mexico can be challenging as large trucks and buses will pass in the opposite direction. Make sure you get gas, whenever you see a gas station as you may not see another open one for 100's of miles. Avoid driving at night you may run into cows or other animals in the road, also it is rare but be careful of banditos, look for cars that are broken down on the highway these usually are traps, many tourists get robbed. If you see a car broken down dont feel bad for not stopping. The government pays a group of billigual mechanics called the Green Angels, that patrol the highways looking for people in need. If you are driving to the Copper Canyon area either by Chihuahau City of Los Mochis you will need a permit for your personal vehicle. Mexican Vehicle Permits can be obtained at Banjercito offices located along the border. You will also need a Mexican Tourist Visa if you plan on staying in Mexico over 72 hours. Mexican Visa permits can be obtained at Mexican Embassies and Consulates within the U.S. and Canada, or at the port of entry with Mexican Consulate Officials. From El Paso Texas , you want to head south on Highway 45. Stay on Highway 45 until you reach Chihuahua City in the state of Chihuahua. 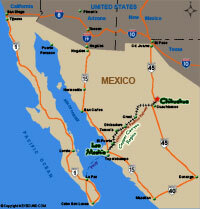 Chihuahua City is approximately 233 miles from El Paso, Texas. Take the I-10 east to Tucson, Arizona. From Tucson, you want to head south on Interstate 19 to Nogales, Arizona. Once you cross into Nogales, Mexico, you want to continue south on Highway 15. Stay on Highway 15 until you reach Los Mochis. Los Mochis is approximately 473 miles from Nogales, Arizona. From Tucson, you want to head south on Interstate 19 to Nogales, Arizona. Once you cross into Nogales, Mexico, continue south on Highway 15. Then follow the same driving directions from Phoenix, Arizona to Los Mochis, Sinaloa above. If you are planning on driving from San Diego or Los Angeles to Copper Canyon, Mexico, there are several ways you can travel. Below is a list of various routes from San Diego to Copper Canyon, via Los Mochis in the state of Sinaloa Mexico. From Los Angeles, California, take the I-10 East freeway and then follow the directions from Phoenix to Copper Canyon, Mexico. From The San Diego area, follow I-8 East to the I-10 freeway, then follow the directions from Phoenix to Copper Canyon, Mexico. Not a preferred route however, from The San Diego area, follow I-8 East to Yuma. From Yuma proceed south on Arizona SR-95 to the town of San Luis. This is a U.S. border town across from the Mexican town of San Luis Rio Colorado. In San Luis Rio Colorado you pick up Mexico Route 2 (MR-2) and follow that east until you hit the Mexico Highway 15. Stay on the Mexico Highway 15 and then follow the directions from Phoenix to Copper Canyon, Mexico. Driving through Baja California then taking the ferry to the mainland of Mexico, may take longer than other routes, however if you have the time this could be a very scenic and adventurous journey. From San Diego take the 5 or 805 freeway south to the U.S. - Mexico border (San Ysidro crossing). Both freeways end at the border so take your pick. After crossing the border, stay in the second lane from the right. Follow the signs that say "Rosarito Beach, Ensenada Scenic Route". This road will take you along the Mexico / U.S. border heading west as you come to the top of the hill, move into the right lane. At the bottom of that hill the road will fork Left and Right, take the fork to the right. It is marked with arrows Rosarito/ Ensenada Cuota. (Cuota means Toll Road). There are three toll booths in total before Ensenada. After you pass the last toll booth it's about six miles to Ensenada proper. About one mile before you get there you'll come to a fork in the road, stay to the "right" and this will take you into town. Get onto the Trans Peninsula Highway or Mexico Highway 1. Stay on Mexico Highway 1 until you reach La Paz. The drive to La Paz is about 22 hours (926 miles) south of San Diego, California. At La Paz you can board a ferry with your vehicle that will take you across the Sea of Cortez to Topolobampo, which is the port next to Los Mochis in Sinaloa mainland Mexico (approximately 7 hours). The directions provided in this section are opinionated general guidelines for driving to Copper Canyon, Mexico. We offer these directions, to show possible driving routes to Copper Canyon. Highways and road conditions are constantly changing, be sure to consult a Mexico road map for official driving routes in Mexico.